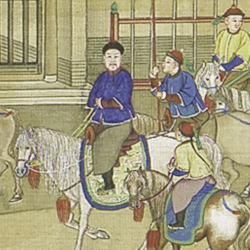 The imperial inspection tours of the Kangxi and Qianlong emperors were unique in Chinese history. Other emperors in other eras had from time to time completed a single inspection tour of the empire or made the epic journey to Mount Tai to worship Heaven, but the Qing emperors were the first to undertake multiple tours of inspection to all corners of the empire. In fact, these personal inspection tours were part of a strategy for extending and solidifying Manchu rule throughout the empire. During his 60-year reign, the Kangxi Emperor completed six southern inspection tours. The Kangxi Emperor's grandson, the Qianlong Emperor, followed his example and also made six southern tours. Politically, the Kangxi Emperor's first two southern tours were the most significant. The emperor embarked on his first tour in 1684, just one year after the suppression of the Three Feudatories rebellion. His second tour, in 1689, was longer in duration, more extensive in its itinerary, and grander in its display of imperial pomp. It was this more splendid second tour that the emperor chose to have commemorated by a set of twelve monumental scrolls, collectively titled "Picture of the Southern Tour" (Nanxuntu). The Kangxi Emperor chose Wang Hui (1632-1717), the foremost master of the "Orthodox School" of painting, to direct the painting of these important scrolls. [See The Grandeur of Art during the Qing for more about the Orthodox School of painting.] Each scroll measures more than 27 inches in height and up to 85 feet in length. The entire set took about 8 years to produce, and if extended end to end, would measure more than three football fields in length. Documenting the pageantry and the politics of the Kangxi Emperor's tour in rich color and vivid detail, these scrolls follow the route of the emperor's inspection tour virtually from beginning to end: from Beijing in the north, along the Grand Canal, crossing the Yellow and the Yangzi rivers, through all the great cultural centers of the South — Yangzhou, Nanjing, Suzhou, and Hangzhou. Each of the twelve scrolls that were commissioned to document this tour takes one segment of the journey as its subject. This unit showcases two of the twelve Southern Tour scrolls — specifically the third and the seventh in the sequence. The third scroll, which is set in the province of Shandong in the north, features tall mountain ranges and culminates with the emperor’s visit to the great sacred mountain of the east, Taishan, or Mount Tai. The seventh scroll shows the Kangxi Emperor's passage in the fertile, flat lands of the South, along the Grand Canal, from Wuxi to Suzhou. One might wonder why the Chinese came to use the handscroll as a format for painting. Consider that almost all early writing systems began with scrolls, such as the papyrus rolls of Egypt, which continued to be used during Roman times. The Torah, the Hebrew Bible, was also written on a scroll, for early materials used for writing, such as papyrus, could not be folded into book form, but had to be rolled. The same was true in China: In earlier periods the Chinese used woven silk or strips of bamboo tied together as a writing surface, and the most efficient way to mount these surfaces was as long rolls. So the scroll format long preceded the use of the codex, or book. And in China the scroll persisted as the format of choice for artists who wanted to create long, narrative pieces, and in particular long, landscape scenes. If one considers the act of unrolling a handscroll, one can see that it can only be unrolled at a certain distance — the distance with which it can be held open with two hands. Thus, the act of handling and viewing a handscroll makes for a very intimate encounter with the work of art, and perhaps this is why the Chinese, in addition to preferring the handscroll format, have always valued the mark of the artist — the "heart print" of the artist communicated through his brush work — as being the most important aspect of a work of art, rather than a visually faithful representation of the external world. The Chinese tradition of displaying a painting is quite distinct from that of Europe. Hanging scrolls might be brought out for special occasions; they might reflect the marking of a season or a special event. After the passing of such an event, however, the scroll would be put away. Because works on silk and paper are light sensitive, they cannot be kept out for long periods of time. As a result, the viewing of paintings was always a special occasion. This is also true for handscrolls. One would bring the scroll out either to regard and enjoy by oneself, or perhaps with one or two others at most. The Qianlong Emperor undertook six southern inspection tours, just as did his grandfather, the Kangxi Emperor. The first tour was completed in 1751, when he had been on the throne 15 years, and like his grandfather, Qianlong commissioned a set of twelve monumental scrolls to document this journey. But the painting of these scrolls under the direction of the court artist Xu Yang (act. 1750-after 1776) did not begin until 1764. The scrolls were completed in 1770, in time to be presented to the Qianlong Emperor on his 60th birthday. Like the Kangxi Emperor's Southern Tour scrolls, the Qianlong Emperor's twelve scrolls were kept together in a special palace storeroom for imperial portraits and maps until the late 19th or early 20th century, when they were dispersed. The fourth and the sixth scrolls in the series are now housed at The Metropolitan Museum of Art in New York City and are the focus of this unit. 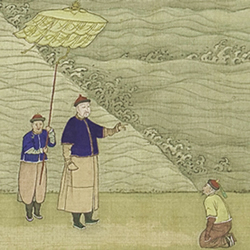 The fourth scroll depicts the Qianlong Emperor's inspection of water control measures at the confluence of the Huai and Yellow (Huang) Rivers and highlights the importance of flood prevention in the low-lying lands of the South. In the sixth scroll the Qianlong Emperor is shown entering the city of Suzhou by way of the Grand Canal. (Both Suzhou and the Grand Canal were important sources of revenue for the Qing government.) Other scrolls from both the Kangxi and Qianlong sets are in public collections in China, Europe, Canada, and the United States. To produce scrolls as large as the ones featured in this unit, a master artist would first create a series of draft scrolls — full-size renditions on paper — wherein he would sketch out the content of each scroll. He would do this in ink and light color on paper, with only suggestions of where figures might be placed. These draft scrolls would then be submitted to the emperor for his approval. After the official approval of the drafts, the silk and lavish mineral colors to be used in the final version would be issued to the artist. The draft scrolls would then become the reference for a team of artists who would set to work on the final paintings, each following his specific area of specialization. Some artists on the team were specialists in architectural rendering, others in the painting of human figures, and still others in landscape detail. It is unlikely that the master artist, Wang Hui in the case of the inspection tour scrolls of the Kangxi Emperor, painted much of the final scrolls himself. His team of subordinates were experienced artists whom he had recruited and brought to the capital specifically to complete this project. All of these artists had been trained to paint in a style that was consistent with his own. Though Wang Hui probably closely monitored their work and the overall production process, the enormous task of actually painting these twelve monumental scrolls mostly fell to this team of subordinate specialists. The Southern Tour scrolls of the Kangxi and Qianlong emperors were never intended for a general audience. Celebratory and commemorative, they were created as historical documents for posterity and not intended to set stylistic precedents or to woo viewers of the time. In spite of their enormous scale, ravishing color, vivid detail, and the vast amount of labor required to create them, these works were scarcely seen at all once they had been produced. They were not put on public display; probably very few members of the court, and certainly none of the public, had access to them. They were kept in a special storeroom for maps and imperial portraits, where they awaited the judgment of history. Today these scrolls serve not only as a testimony to the political ambitions of the Qing emperors to preside over a prosperous, unified empire, but also provide invaluable documentary evidence about daily life in traditional China. The Kangxi Emperor’s southern inspection tour took him to some of the most significant cultural sites in the empire. It is important to remember that a key function of the Southern Tour paintings was to commemorate and highlight those moments when the Kangxi Emperor performed a significant ceremony or ritual activity that underscored his identity as an ideal Chinese monarch. Early on in his tour, as is documented in the third scroll of the series, the Kangxi Emperor is shown visiting the sacred mountain of the east, Taishan, or Mount Tai. Scroll Three is about 45 feet long, and it shows the Kangxi Emperor at the outset of a day's journey on the city wall of Ji'nan, the provincial capital of Shandong. The scroll then follows the course of his entourage and his outriders all the way to the sacred mountain, which is in effect the scroll's "finale." The Kangxi Emperor’s visit to Mount Tai was a particularly significant event because he was Manchu and not ethnic Han Chinese, for the Qing dynasty was in fact a conquest dynasty. As a non-Han ruler, the Kangxi Emperor was faced with the question of how to fit, as an outsider, into the Chinese pattern of cosmic integration — of how to define for the conquering Manchu rulers a place in the Han Chinese cosmos. In fully acting out his role as the Son of Heaven, a Chinese emperor had a series of annual religious responsibilities, including the ceremonial worship at the Temple of Heaven (the imperial sacrificial altar in Beijing). But only emperors who were worthy of asking Heaven for its benediction dared to go to Mount Tai, ascend the mountain, and perform a sacrifice to Heaven there. The Kangxi Emperor did not actually perform a sacrifice on Mount Tai, but the very fact that a Manchu emperor would go to this sacred mountain, climb it, and record that event in a painting for all posterity was something that reverberated throughout the empire. Everyone took notice of this extraordinary event. In effect this act was a way for the Kangxi Emperor to declare openly what kind of ruler he wanted to be; to say that he wished to rule China not as a Manchu emperor opposed to the Han Chinese, but rather as a traditional Han monarch, ruling over a traditional Chinese empire. Throughout history management of the empire's vast network of rivers, canals, and irrigation systems has been a fundamental task of China's rulers, while the threat of floods has been the greatest threat to economic and political stability. During the Qing dynasty, insuring that the Grand Canal remained passable for the transport of grain taxes and commercial goods from Southern China to Beijing, the capital in the north, was a paramount concern. The fourth scroll in the series recording the Qianlong Emperor's first southern inspection tour of 1751 depicts the emperor looking over the confluence of the muddy, yellow waters of the Yellow (Huang) River and the clear waters of the Huai River, which was the critical point in the entire water control network of Southern China. Until 1860 the Yellow River flowed south of the Shandong Peninsula toward the ocean, and before reaching the ocean, merged with the Huai River. That point of convergence was the place where flooding was most likely to occur, for the Yellow River carried so much silt that it was constantly filling up the river bed and was prone to overflowing its boundaries. Flood prevention here was essential, for if the Yellow River overflowed, it would flood much of the arable land in Southern China. Thus, the confluence of these two rivers was the center of a great deal of attention throughout the Qing dynasty, and enormous stone dikes and a number of complex waterways were built during this time to prevent flooding in this area. The seventh of the twelve scrolls recording the Kangxi Emperor's second southern inspection tour takes the viewer from the city of Wuxi to the city of Suzhou in the fertile Yangzi River delta region of China. This is the commercial heartland of the empire — an area crisscrossed with a network of canals and prosperous cities. Fully one-third to one-half of the economic wealth of the entire empire was concentrated in this area, and it was enormously important for the emperor to ally himself politically with the gentry of this region. 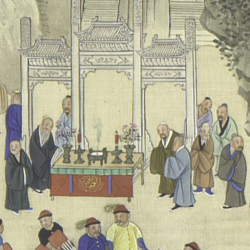 The culmination of the seventh scroll depicts the Kangxi Emperor's residence in Suzhou. It was not at the house of the provincial governor, as might be expected, but rather at the house of the Silk Commissioner, who was technically the emperor's bond servant. The Silk Commissioner was part of the emperor's private entourage, but was stationed in Suzhou in order to supervise the manufacture of silk. Suzhou was the center of the silk manufacturing industry in China, and silk was one of the commodities that was an imperial monopoly, the revenue from which went directly to the emperor's "privy purse," which refers to those monies used exclusively to underwrite the cost of running the imperial palaces. These monies were the private purview of the emperor — his private, discretionary funds — and they were not part of the government taxation system, which of course collected monies for the expenses of the government itself. Being a major source of funds for the imperial privy purse, Suzhou's silk industry was of special interest to China's rulers. The sixth of the twelve scrolls recording the Qianlong Emperor's first southern inspection tour depicts the emperor visiting the city of Suzhou, just as his grandfather, the Kangxi Emperor, had done some 60 years earlier. Suzhou remained the cultural capital of China even into the 18th century, and both emperors' visits underscore the importance of Suzhou to the imperial household as well as to the rich commercial life of China under the Qing dynasty. Following the Grand Canal from the outskirts of Suzhou, past Tiger Hill, to a panoramic view of the walled city, the sixth scroll depicts the Qianlong Emperor entering Suzhou on horseback, in preparation for riding the final leg of his journey to the Silk Commissioner's residence, where he was to spend the night, just as his grandfather did. The sixth scroll also shows the imperial barge of the Emperor’s mother, who accompanied him on his tour, being pulled along the Grand Canal on the outskirts of the city. During Qing times the Grand Canal was a major conduit for grain, salt, and other important commodities. Any taxes that were paid in kind were paid in grain, which was shipped along the Grand Canal. Thus, control of the Grand Canal was of critical importance to Qing rulers. Scroll Six follows the Grand Canal past a number of commercial streets where various trades people, stores, and restaurants showcase local products. The scroll shows that a number of temporary stages were erected for performances held in honor of the emperor, in order to entertain him and his mother as they pass along the Canal. The scroll also depicts several gardens, for which Suzhou was renowned. During the Qing period, much of what Europeans learned about China came from the reports of Jesuit missionaries, who had lived in China since the late 16th century and were enormously impressed with what they found in China during this time. The European interest in Chinese naturalistic gardens of this time may have contributed to the transformation of gardening in Europe.